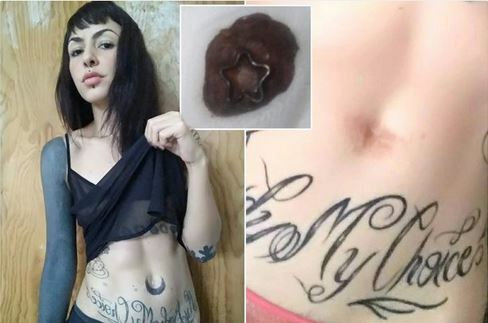 A 23-year-old woman removed her belly button and gave it to her ex-boyfriend as a present. Paulina Casillas Landeros, from Jalisco, Mexico, underwent numerous surgeries such as a ‘back corset’ which involves piercings on either side of the spine and a split tongue. She later decided to remove her belly button as it is “what makes us human” before giving it as a present to her then boyfriend Daniel Ramirez, in 2015. But following the removal three years ago, she says she ultimately regrets her decision describing it as “reckless” and “impulsive”. The HR intern and tourism student said: “I have always had problems with my family, I was not very close to them at the time. “Body modifications fascinated me, there is something very transcending about them. “I was very angry, I wanted to cut all unions from everything and everyone. “I wanted to dehumanise myself in a symbolic way, I wanted to do something controversial. “I underwent an ‘operation’ done by a professional but he gave me very bad advice on how to take care of the trauma so it got infected. Paulina said she knew she wanted to give the body part to Daniel as an ultimate token of love. Paulina says her relationship with her family has now improved. The post Ladies Can You Do This? Pretty Lady Removes Her Belly Button And Gives It To Boyfriend As Present (Pictures) appeared first on Naijaloaded | Nigeria's Most Visited Music & Entertainment Website.